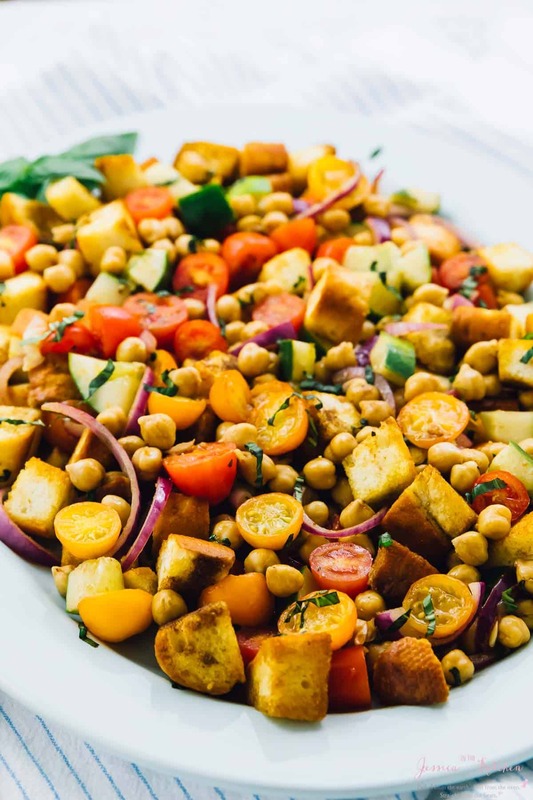 This Chickpea Panzanella Salad is made with only 7 main ingredients and is SO addictive! It’s perfect for any get togethers, parties or even a delicious lunch or dinner! HAPPY SUMMER! WAIT. False alarm – I’m still early for that. I’m not sure what the weather is like by you, but I am absolutely melting over here!!! The weather is already screaming summer, so why don’t we go ahead and get ready for all those amazing summer barbecues, get- togethers, pool parties and just straight up fun events that you’re going to?! 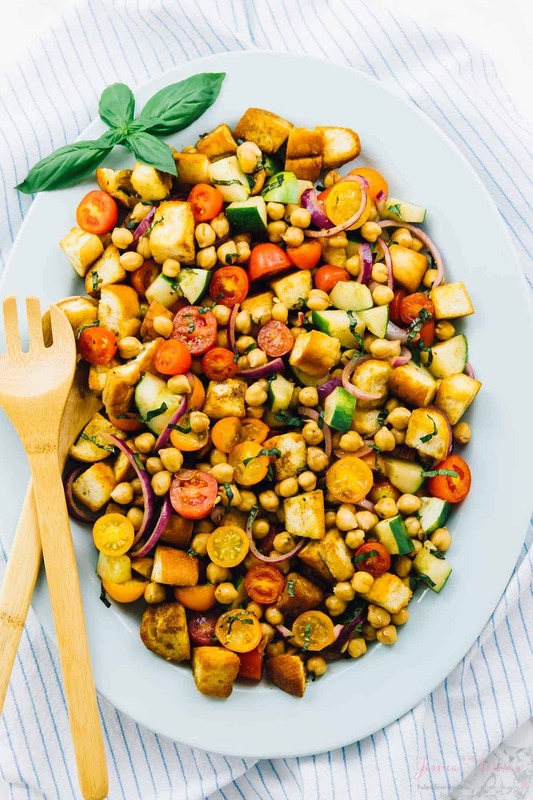 This Chickpea Panzanella Salad will wow your guests, your kids, your family and most importantly your stomach. SO much flavour, so easy to make and SO filling thanks to all that protein from the chickpeas. 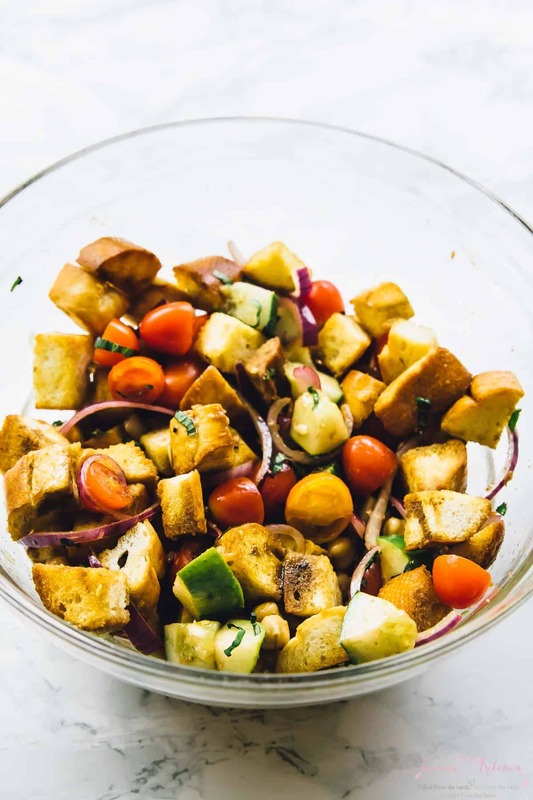 Do you remember my Greek Panzanella Salad aka Tuscan Tomato & Bread Salad? After making that and enjoying it, I knew I would have to come back with another Panzanella Salad for you. If you’re not sure what this is, it’s literally the best version of salad ever. It’s toasted bread which soaks in a delicious balsamic vinaigrette but DOES NOT get soggy (mind-blown), combined with tomatoes, cucumber and red onions. That’s it. The flavours are so on point, and I used my absolute favourite balsamic vinaigrette for this salad. First of all, it’s the most ingenious way to serve fancy 10x better croutons, and the fact that it gets better the longer it sits in your fridge is EVEN better. 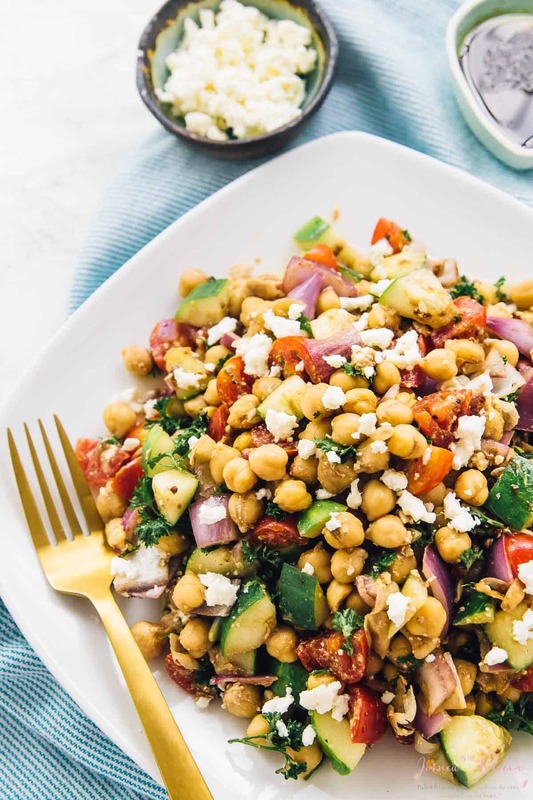 So I wanted to add some more greatness to this salad without over doing it, and it hit me that I used this same dressing in my 15 minute chickpea salad. It wasn’t long before my brain did the math and realised that my chickpea salad was basically this minus the bread. 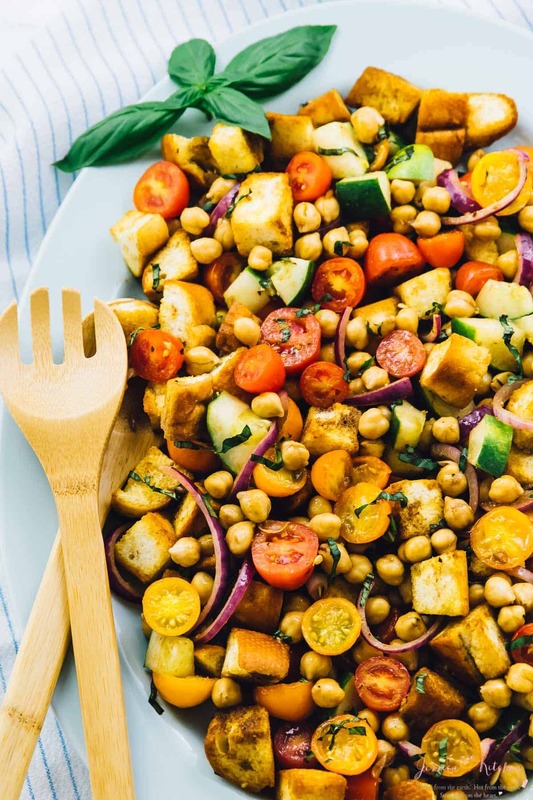 Thus, this Chickpea Panzanella Salad was born. Not only do chickpeas add even more flavour and some delicious texture, the protein means you stay full friends! That also means that this salad could easily be packed as a work lunch and it would keep you for the rest of the day. Tasty and actually filling? Win win. My basil has been growing like crazy, so I definitely knew I would have to serve that up with this. Basil has such a beautiful flavour and it just honestly enhances all the deliciousness already going on here. This salad takes like, 15 minutes to make, and then you can leave it to sit for 30 minutes to up to an hour. Trust me, the 30 minutes is so worth it. In fact, taste it right before, and then taste it after 30 minutes, and I bet you’ll see a grand difference in how the vinaigrette soaks into everything and delivers so much flavour. 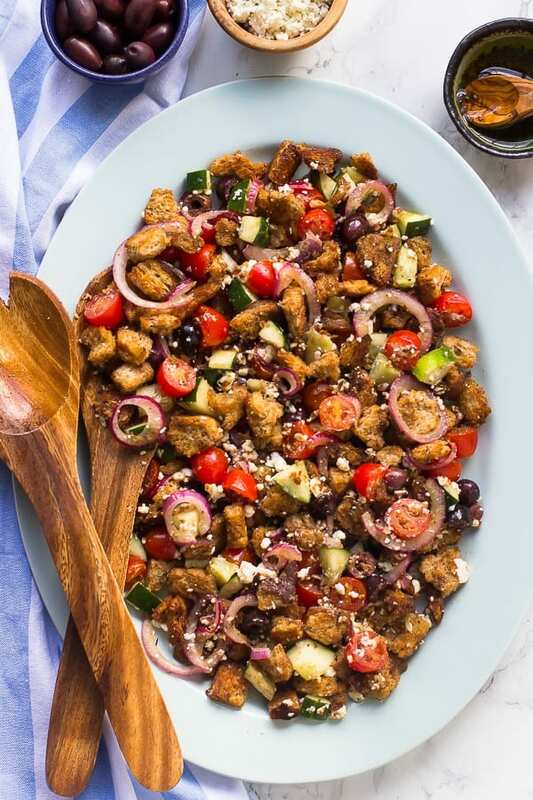 Final point before I give you the recipe for this Chickpea Panzanella Salad 🥗 – you HAVE to toast the bread. You should use a stale bread – I like to use a baguette from our neighbour bakery, since this is already a great dry candidate for our salad. Toasting the bread helps to prevent it from getting soggy, so this step will keep your salad even longer. Enjoy and happy eating!! P.S. 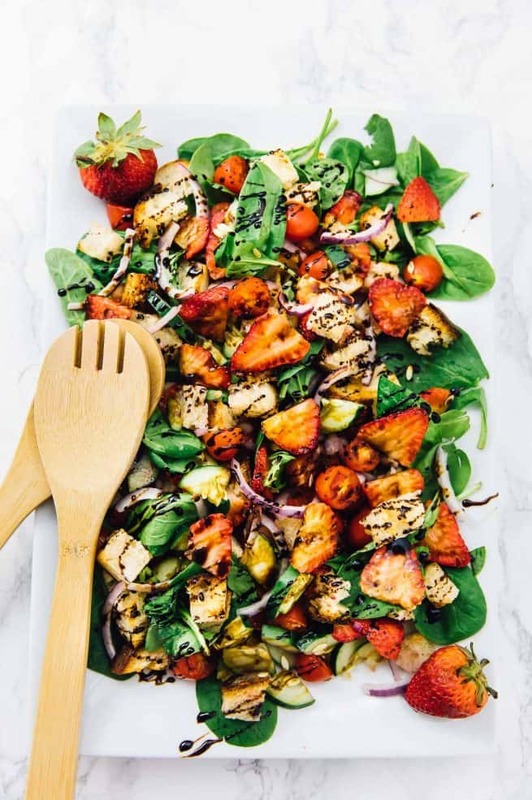 be sure to also check out my Strawberry Panzanella Salad with a Balsamic GLAZE. YUM. Mix all the ingredients for the vinaigrette while the bread is toasting so that the mustard can emulsify. Add the bread cubes to a silicone mat on a baking sheet or a baking sheet prepared with parchment paper or foil. In a large mixing bowl, add the toasted bread, the cherry tomatoes, red onions, cucumber cubes, chickpeas and basil. Toss until combined. Cover the salad and let sit for 30 minutes to up to an hour so that all the ingredients are completely soaked in and the flavours combined. Serve and enjoy! This salad can last in the fridge up to a day as it is. You can store it in an air-tight tupperware container. What I would suggest for a meal prep is to make the salad and the bread separately and then plate appropriately when you are ready to eat. 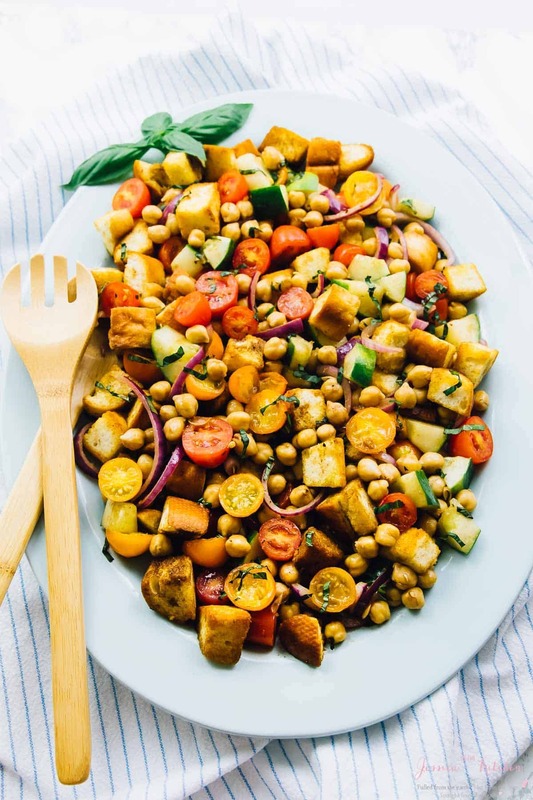 If you try this Chickpea Panzanella Salad please let me know in the comment section below, or tag me on instagram with the hashtag #jessicainthekitchen! For more exclusive recipes follow me on Instagram AND on Snapchat: jessinkitchen. I would happily devour the whole plate! Can’t resist a good homemade salad! this salad looks pretty good! I think that the vinaigrette makes all the difference! Thanks so much Makos and you’re so welcome! !